Michigan Trails and Greenways Alliance facilitated the coordination and collaboration among a variety of greenways groups and other partners for the purpose of developing an interconnected greenway system within the City of Detroit. 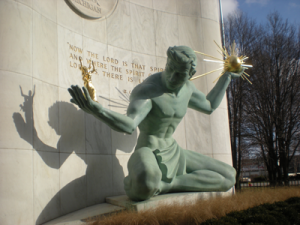 From this work, the Detroit Greenways Coalition (DGC) was born. Their mission is to create a strong, healthy, vibrant City of Detroit and region where a seamless network of greenways, green spaces, blue ways and complete streets are an integral part of people’s active lifestyle including day-to-day transportation and recreation. The DGC works to promote and build a network of greenways and bike lanes to connect people and places, improve the quality of life, beautify neighborhoods, and stimulate neighborhood-level economic development in Detroit. Their mission is to create, conserve and promote greenways and green spaces in order to connect people, places and nature. Hired Todd Scott as the Detroit Greenways Coordinator (2007-2014) on behalf of Michigan Trails and Greenways Alliance. Developed and advocated for more greenways in Detroit, growing from 12 miles of pathways and bike lanes in 2006 to nearly 68 miles in 2012, and with another 102 miles to be constructed in 2013. Helped bring millions in grant funding for greenways since 2006, including a $10 million Transportation Investment Generating Economic Recovery (TIGER) grant from the U.S. Department of Transportation in 2012 for Link Detroit project. Developed a model citywide greenway maintenance program with the Greening of Detroit and helped raise $700,000 to fund this program since 2010. Secured City Council endorsement of the Detroit Non-Motorized Transportation Plan in 2008 and continues to advocate for its implementation. Assisted the Healthy Environments Partnership with greenway and active living mini-grants. A total of $27,500 was distributed to small, block club-led efforts near greenways throughout Detroit. Presented seven Complete Streets workshops throughout Detroit. Funded and operated a Youth Earn-a-bike program in 2012 for the Osborn neighborhood which taught biking and mechanical skills to neighborhood youth while giving away 30 bicycles. The Detroit Greenways Coalition stands as their own organization and has recently completed a strategic plan which will allow it to achieve even greater progress in the years to come through becoming a fully staffed and funded nonprofit organization within the City of Detroit. There is tremendous opportunity for more greenways in Detroit through abandoned railroad corridors that are continually being evaluated. In some areas, vacant properties could be stitched to form a greenway. In addition, Detroit’s streets are overbuilt for the traffic they carry. Assessing and reorganizing the streets to add bicycle lanes is an ongoing initiative.